This year’s New Standards holiday show at the Fitzgerald Theater is richer, nuttier and undebatably more satisfying than Aunt Martha’s fruitcake. With an emphasis on the nuttier. 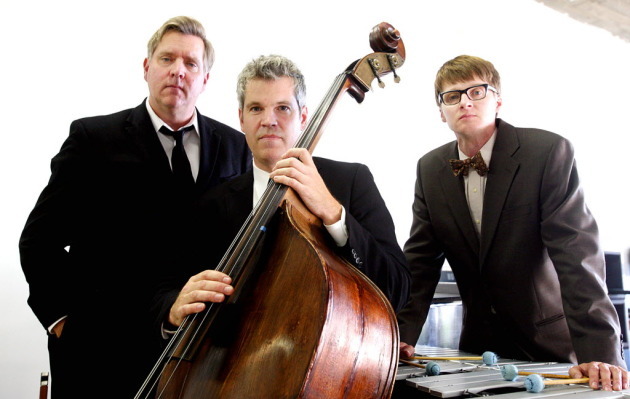 The New Standards — pianist/singer Chan Poling, bassist/singer John Munson and vibraphonist Steve Roehm — are a Twin Cities trio known for their lounge-jazz interpretations of pop hits. For their annual holiday show, the trio invites a parade of guests. For this year’s fifth incarnation, the invited performers were neither advertised nor mentioned in the program distributed by ushers. The surprises worked big-time on Friday night at the soldout Fitzgerald. How bout Edina-bred, Brooklyn-based Craig Finn of the Hold Steady doing the Band’s "Christmas Must Be Tonight"? You often see the impassioned Finn hyper-emoting but not in a suit, tie and white shirt. How bout Hugo Klaers, drummer in Poling’s other band the Suburbs, doing a Lou Reed-evoking recitation of "You Make My Heart Beat"? How bout Matt Wilson, Munson’s old bandmate in Trip Shakespeare, soaring on the Helen Reddy power ballad "You’re My World"? Helen Reddy?! Who knew that Wilson had such a big voice? How bout John Moe, Munson’s partner on the MPR radio show "Wits," weaving a clever, faux-erudite tale about Frosty the Snowman as a winter icon? How bout the Current DJ Dave Campbell’s charmingly cheesy tribute to Andy Williams dressed in red-and-white, looking like a candy cane-themed Target elf? How bout Bret Farley’s animated film featuring the New Standards gigging in a bar called the Trough? How bout the fake snow falling during the final chorus of the always invigorating rendition of Trip Shakespeare’s "Snow Days?" How bout Poling’s closing "At Christmastime Next Year," a brilliant new addition to the holiday canon? What a wonderful, therapeutic sentiment for a guy who just lost his wife, Eleanor Mondale Poling, to cancer this year. As always, the New Standards — who will reprise the concert Saturday — have done an inspired job of plucking talent from the rich pool in the Twin Cities. Many concertgoers were introduced to the arm-gesturing soulfulness of Aby Wolf and the downhome bluegrass spirituality of the Roe Family Singers, who played during the long intermission (great idea) and later with the New Standards (loved the solo by the Roe’s Adam the Sawman). As is their tradition, the New Standards redefine yule-show standards. Not only do they give you "Silver and Gold" but also "After the Goldrush," the Neil Young psychedelic-folk chestnut given a gorgeous reinvention with strings and muted horns, along with Jimi Hendrix’s "Manic Depression," Gnarls Barkley’s "Crazy," Dan Hicks’ "I Scare Myself" and a terrifically uplifting revamping of Michael Jackson’s "The Way You Make Me Feel." Munson has amped up his chattiness and humor quotient. However, on Friday, amid all his chatter, he neglected to introduce the large cast of supporting players, including drummer Ken Chastain, five horn players, three string musicians and a rotating cast of four or five backup singers. Not all the ingredients seemed necessary for this hipster holiday revue. Among the missteps were a cramped-space tango dance by Rebecca and Joe Chvala during a tango treatment of "Do You Hear What I Hear" and Lucy Michelle’s cutesy reading of "White Christmas" accompanied by a phalanx of ukulele players. And there was one missing spice: Some voices of color. Of course, you could quibble with Aunt Martha’s fruitcake, but you just digest it with a smile in the spirit of the season.